The theme for this year’s Software Technology Conference (STC) is “Meeting Real World Challenges through Software Technology”. As technologists and as citizens, we are faced with myriad challenges from defending national security, to ensuring the robustness of our critical infrastructure, to sustaining and enhancing large portfolios of legacy systems – all within ever tighter resources constraints. Attending STC 2014 Long Beach will provide both you and your organization with immediately usable insights and practical solutions from software technology professionals facing the same challenges you face as you strive to ensure your organization’s success and your own professional growth. You can expect to return to your organization more knowledgeable of emerging technologies and methodologies; more capable of solving tomorrow’s challenges; having met other like-minded professionals to begin the collaboration process. The STC 2014 provides a forum for software and software intensive systems enterprise leaders from Government, industry, and technology research organizations to share their vision and perspective directly with practitioners, managers, engineers, and innovators. The 26th annual IEEE conference is being held at the Westin Long Beach, in Long Beach, California from March 29th through April 3rd, 2014. Registration is open with discounts for IEEE members. 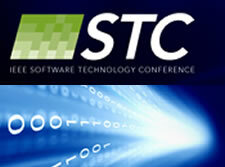 The Software Technology Conference (STC) was founded in 1989 by the Assistant Secretary of the Air Force for Acquisition (Communications, Computers and Support Systems) SAF/AQK, Mr. Lloyd Mosemann, through the Software Technology Support Center (STSC) at Hill AFB, UT, to provide information and training on software engineering issues and technologies. At the first event, approximately 200 individuals attended that three-day conference with 15 Exhibitors. In 1993 the conference expanded to encompass subjects of interest to all branches of the service and to provide a forum for the exchange of information between the joint services. Through the 1990’s and early 2000’s the conference was jointly sponsored by the United States Army, United States Marine Corps, United States Navy, United States Air Force, and the Defense Information Systems Agency (DISA). In 2004, the conference name was changed to the Systems and Software Technology Conference (SSTC) which reflected the incorporation of a more in-depth systems engineering aspect relevant to the interests of the DoD in advancing the application of systems engineering principles to Defense systems. Today, the conference has been refocused on software and has re-emerged as the IEEE Software Technology Conference (STC). Software is a primary enabler as well as major cost driver for our current and emerging systems. Effectively addressing software acquisition, development, and sustainment challenges, including safety and cybersecurity, is key to system and mission success. STC is focused on bringing you insight into current software technology issues, proven solutions, and lessons learned applicable to Defense, civilian agency, and industry stakeholders. The 26th Annual IEEE Software Technology Conference in Long Beach, CA looks forward to seeing you later this month!